This year, Iran organized first World Slalom Series competitions. Representatives of this country already surprised us many times by their sports achievements. 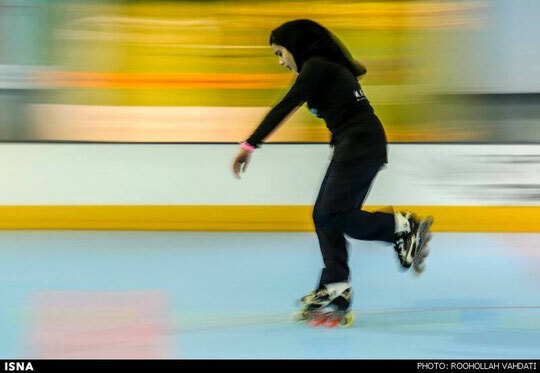 Iranian skaters became famous as very fast opponents in Speed Slalom so let's hope the local competitions will motivate skaters and will bring us new potential stars. 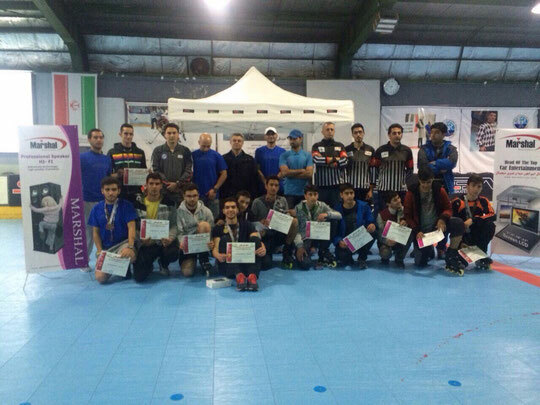 The very first Iranian Slalom Series event 2015 was held on February, 5th - 6th, in Tehran and was dedicated to Speed Slalom. 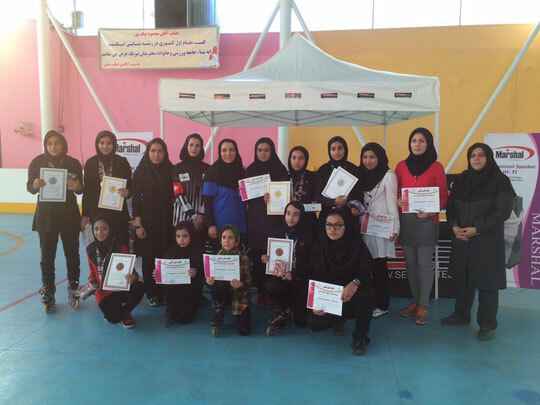 64 skaters, all from Iran, were competing for the victory in Senior and Junior categories. For senior category, 23 men and 11 women were taking part in this competition. Includig impressing Laya Arabi who is improving year by year and Farbod Motevasel, who already showed great results in 2013. In the men's discipline, Kabir Parsa (#135) won the Speed Slalom final, beating all his strong opponents. This is his best result so far, after 8th place of the Asian Roller Skating Championships (ARSC) 2014 in Seniors and 9th place of WFSC 2013 in Juniors. Mahdi Mohammadi Najafabadi (#331), who started his competing career on the 9th place of the ARSC 2014 in Seniors, did great in finishing second. Motevasel Farbod did the best qualification time (4,483 sec) and ended up third. He took 5th place at the WFSC 2013, and showed best trial time of that big event (4,471 sec), beside this, the same year he almost won the Rollerclub Cup, 3 cones event in Moscow, where showed the best trials time (4,26 sec) and lost the final's third run to Simone Nai Oleari (Ita) for only 1 tenth of a second. The newcomer Sajad Mohammadi Sasan was strong enough for his very first event to finish fourth. Arabi Laya, (#51), who finished fourth at the WFSC 2014 in Seniors and was third of the WFSC 2013 in Juniors, showed the best qualification time (5,000 sec) and won the final against the newcomer Abedini Mina, who did a great results for her first competition and showed an impressive qualification time (5,096 sec). Another newcomer, Golgouneh Shaghayegh, won the consolation final in front of Hoseini Zahra Sadat (#488) and took the third place. From 18 skaters In the Junior men's category, Ranjbar Vakili Pedram (#395) showed the best qualification time of the whole event (4,351 sec) and got the victory in front Reza Lesani (#402), who started his career in 2014 and showed some good results already. Two newcomers, Mohammadi Mohammad and Savari Amir Mohammad finished in the small final at 3rd and 4th places respectively. Karbasi Niloufar (#228) won the Women's Junior final and performed the best qualification time of her category (5,204) out of 12 competing girls. The newcomer Tarane Ahmadi did a great result, finishing on the second place. Zahra Bagherzadeh Najafabadi (#283) won the consolation final, leaving Ghayour Sahar, who did her very first competition, on the fourth place. The second Iranian event took place on March, 6th and was focused on the Slide discipline. 16 men were competing for the victory that day, and only four of them had already some competing experience. Newcomer Alimadadi Behnam showed an excellent result and won the Slides final in front Rais Rohani Hafez (#202). Other newcomers, Armand Navid and Molla Norouzi Danial were competing for the third place in the small final. Armand Navid took the third place, leaving his opponent at one step from the podium. 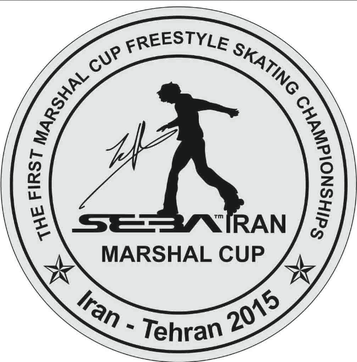 Another event, Battle Marshal Cup was held in April, 16-17 and gathered 15 skaters of the men's category. Bronze medalist of the Slides event, Armand Navid (#747), got the victory of his very first Battle final. Rais Rohani Hafez (#751) got one more silver medal, competing in the Battle for the first time in his carrier. Kabir Parsa (#197), the winner of the Speed Slalom Senior competition, finished third and left Darabi Danial (#792) on the fourth place. What are your thoughts and feelings about this competition and about your victory? How often do you skate and how does your typical training look like? What motivates you to train? Which skater do you admire? Which competitions you plan to visit? Would you want to say something to other skaters or thank anyone? "The competition was very well managed and although it was the first competition with world ranking, so the organizers did a very good job. I was excited because it was my first victory and the concurrence was very close and hard because all of the good skaters were participating. Right now I skate about 4 hours a week because of my exams for entering university, so I have to study a lot. Usually I train about 2 hours of speed slalom and 2 hours of the rest of the disciplines. My love to my skates and my friends motivate me and I admire Brivio Savio in Speed Slalom and Igor in Freestyle. Unfortunately I have no plans for 2015 because of studying hard for my exams :( but I'll train hard after finishing high school and I'm planning for WFSC 2016. I want to thank my coach, Farhad Mahdavi, for guiding me all the time and my family and friends for supporting me and Hiva tejarat CO for sponsoring the competition. At the end I want to say that even when life turns back on you, your skates are there for you, put them on and you'll see their magic!" 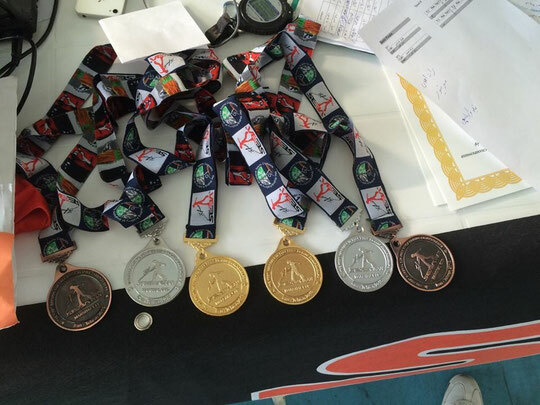 "The competitions I had until now were very good and full of experience for me. I had a really good feeling when I made my coach proud of me and all my trainings had a good result. I train about 5 times a week every time about 3 - 4 hours and 2 strength trainings. My motivation for training is World Championship gold medal. My goal for 2015 is making my speed slalom time better and to be 1st or 2nd in WFSC. I want to thank my coach for being beside me all the time and I want to say that you should try all the time and having perservance. " "The most important aim of joining to this competition for me is to win the first prize. I do training 6 days a week and 4 to 6 hours a day and I concentrate on only one action and do it more and more to overcome it as the best competitor. I would like to become number one skater in slide skating throughout the world. I am thinking to the goal and becoming the best player in the world which motivates me to do training every day. I admire mr. Zhao Zhen Hua from China. My goals for 2015 is to take part in the world competition in this year to reach my aim to be the best competitor and winner of the first prize. To other skaters i would want to say :"love your aim and believe it"
"I'm so glad for my victory and proud of myself . Now I am skating every day, and training all the basics elements of freestyle slalom. I find my best motivation in the competitions. I don't have any idol in skating.., i focus on myself. I would want to visit the word level competitions and i hope i would be able to make it one day. I would want to thank Sebastien Laffargue for showing Freestyle to the world"